We pulled together 14 top-rated humidifiers and put them to the test. We ran each for at least a week, all day and all night, and tried out all the features. We tested their ease of use, durability, safety features, noise levels, and capacity. What remained are nearly a dozen of the best humidifiers on the market. Whether you're combating the winter's dry air or treating coughing, dry and sore throats, colds, croup (we have croup sound files here), stridor, or just a stuffy nose, these humidifiers are perfect. For more details about how to pick a humidifier, and our hands-on review process, see the bottom of this article. Otherwise, here are the results! Here are the Best Baby Humidifiers of 2019! 1. TaoTronics Cool Mist Humidifier. About $50. This humidifier offers the overall best features at a truly excellent price. This unit has 3 different speed settings (low, med, high): the low setting is super quiet, and the medium and high settings are still very quiet overall. This humidifier has a much larger tank than the Pure or Anypro, coming in at 4 liters (just over a gallon of water). It is rated for 15 hours of humidifying (at its low setting), which tells us that this unit does an excellent job getting the moisture into the air. How do we know? Well, if it has a bigger tank than most others and is running out after 15 hours, then all that water is going into your nursery! This humidifier also has several advanced features and a nice LED screen. It has a built-in humidity meter to tell you what the current conditions are in the room. It has a sleep timer you can set at night, a rotating nozzle, and a sleek profile. Refilling is a bit more cumbersome than the Pure because it's a bigger tank to fit under the faucet (we used our kitchen sink); but that big 4-liter tank also means it lasts longer without refilling. Cleaning is the same as the other units: clean out the tank and brush off the metal ring. The reliability on this unit is fantastic, and the company is very responsive to any questions or concerns. 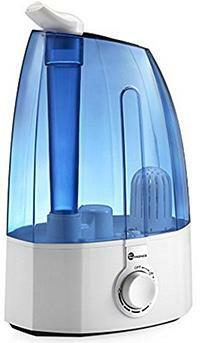 Other than being a bit harder to fill, there are no other drawbacks to this humidifier other than the higher price tag. Not for use with aromas or essential oils (see #2 for that). Definitely highly recommended as an excellent, high-capacity and high-tech nursery humidifier. Interested? You can check it out here. 2. 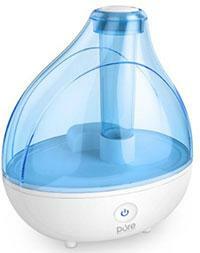 AnyPro Cool Mist Humidifier. About $50-60. A good price for one of the best overall humidifiers on the market. This humidifier has a 3.5-liter tank, with a continuous mist control knob allowing you to customize the amount of mist being produced. At its lowest setting, we found that it lasted over 30 hours (! ), and at its highest setting, it lasted about 14 hours. That's on par with the Taotronics, but for almost half the price. It's an overall simple humidifier: no filters to change or clean, a single knob controls the intensity of the mist, and there is a single button to turn on a night light. The cool thing about the night light is that it's a subtle colored glow. If you press the button once, it will cycle through a few different colors (red, green, blue, white, yellow, purple), and if you press the button again it will stay on whichever color is currently showing, allowing you to customize the night light glow to your preference. Nice touch! The nozzle on the top spins to adjust where the mist is pointed, and there is also a small aromatherapy essential oil diffuser on the top next to the nozzle. Add a couple drops of your favorite aroma to that diffuser and your room will be smelling great! It also has a sleek, low-profile form factor, and is very quiet. Only a tiny bit of gurgling water every once in a while, otherwise you won't even know it's on. Note that the gurgling sound happens with all cool mist humidifiers. There is a small brush mounted in the base to help keep the stainless mist plate clean. Cons? Well, the nozzle and aromatherapy diffuser on the top tend to fall off when you flip the humidifier over to fill with water. So, you need to pop off at least the aromatherapy diffuser's tiny cover before you bring it to your bathroom or kitchen to fill with water; otherwise, you might end up losing the little cover down the drain like we did! But that really takes a second to pop off when bringing to refill. Other than that, this is a truly excellent humidifier for an awesome price. Highly recommended! Interested? You can check it out here. 3. TekJoy Cool Mist Humidifier. About $50. This is an excellent humidifier that offers great bang-for-the-buck, reliable operation, and a great range of features. Its tank is a bit smaller capacity than most of the other humidifiers on this list, coming in at 2.5 liters. In our testing, it was enough capacity to get us through the night at a medium setting (about 10 hours), and enough to get you through about 6-7 hours on the highest setting. Related to that, there are three auto-off timer settings you can use, one for 4 hours, 8 hours, and 12 hours; but realize that it also turns off automatically when it detects that the unit is out of water. Out of the box, the humidifier was easy to assemble, felt durable and high quality, and everything worked very easily. The fill cap was easy to unscrew, the tank was super easy to fill up and fit under our small bathroom sink faucet (which is awesome, by the way, so you don't have to bring it to the kitchen to fill up), and the reservoir was easy to put back onto the unit. Speaking of which, there is a convenient handle on the top of the reservoir which helps a ton. The three cool mist settings were reasonable - the low setting was very light, the medium setting was decent, and the high was not as powerful as some others on this list but still pretty respectable. But let's get to the part our kids loved the most - the lights! This humidifier operates as a night-light with a subtle glow from inside the tank. There are 9 options - off, or one of 8 different colors. The best part is that you can use it as a night-light even when the humidifier itself isn't turned on. Great feature! Some other things we liked were the nozzle that you can position in any direction (but not up/down), the included cleaning brush, SUPER QUIET operation, and apparently very good customer service. We never had to deal with the TekJoy customer service ourselves, but we have heard great things. We've been testing this humidifier for about a month, but we will update after a longer-term test. It does have a couple small limitations worth mentioning. First, there is nowhere to store the brush inside the tank - there is a little slot on the underside of the tank (which is odd), but nothing to hold the brush in, and no groove on the bottom part to keep it in place. Second, it has a limited tank capacity, though for a nursery it's a really nice compromise between capacity and price, and unless you have a 300+ square-foot nursery this will definitely do the job for you. Highly recommended! Interested? You can check it out here. 4. Pure Ultrasonic Cool Mist Humidifier. About $50. A great overall humidifier; in our testing, this humidifier lasted for over 14 hours; this was great because you can turn it on 2-3 hours before bedtime (maybe like 4 pm) and it would go all the way to morning (about 8 am)! Another great feature is that it's very simple to operate: there literally is only one button that controls the power and whether the subtle glowing night light is on or off. Here are some additional features: you can swivel the nozzle around 360-degrees to position it exactly how you'd like. It shuts off automatically when the water level gets low, or if the tank is removed. We also think it is the quietest one on the list - like, really super quiet (you'll be surprised). No annoying filters to clean, no complicated features, and all at a really great price. If you want a humidifier with fancy features, check out the TaoTronics option above, it's also a great humidifier. The only con with this humidifier is that its tank is quite small, at only 1.5-liters capacity. That means that even though it may last an impressive 14 hours, you're actually not getting as much moisture into the air during that time relative to other humidifiers on this list with larger tanks. Interested? You can check out this Pure Humidifier here. 5. 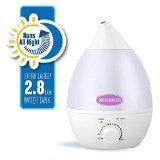 Safety 1st Soothing Glow Cool Mist Ultrasonic Humidifier. About $40. We got our hands on this humidifier for testing in early 2019 and were pretty pleased with its overall performance. It has a smaller capacity than the bigger humidifiers on this list, coming in at about 3 liters (.8 gallons). In our testing, at the lowest setting it lasted for just about 24 hours, which is pretty impressive, though at that setting you could barely see any mist coming out of it at all. Though there is a nice continuous dial to change the mist intensity, it basically still only has a low, medium, and high setting since once you start turning the knob it quickly gets pretty intense. At a more medium setting , it lasted for about 16 hours. So that's probably enough time to turn it on at bedtime and off early in the morning, and be able to do that for 2 nights in a row without refilling the water. At the highest setting, we think it lasted for about 6 hours - we're not really certain because it ran out of water at some point in the middle of the night and we didn't see it until the morning (about 8 hours later). In our testing we found a couple things we really liked. First, when you're refilling the tank there is a carry handle on the bottom, which is helpful. Second, we love the concept of a humidifier with a night light, and this has a nice subtle glow to it that our kids really liked (note that the humidifier has to be on to use the night light option, and if you use it when the tank is empty then you have to deal with the red "empty" light also being on). Third, it was really quiet and has only a very subtle hum to it while operating, and a little bubbling/gurgling sound every hour or so (which they all have). Other than those, it has many of the usual options, like auto shut-off when it runs out of water, no filters to replace, a nozzle that rotates around 360-degrees so you can position it however you'd like, and it's relatively easy to refill. Overall, we like this humidifier and think it is worthy of this spot on our list, especially given the awesome night light feature. After we've used it for several months, we will update this review to reflect its long-term reliability. Interested? 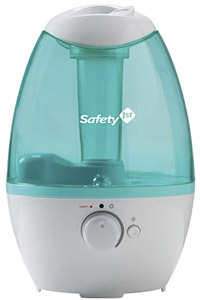 You can check out this Safety 1st Soothing Glow Humidifier here. About $50. Another great option made by TaoTronics, with a bit smaller capacity than the big one at the top of this list, coming in at 3.5L. That's still quite a large capacity for a cool mist humidifier, and it lasted for about 10 hours on high, and for about 24 hours on low setting. So on the high setting, you're getting over 330 ml of moisture into the air per hour. It uses a continuous knob to adjust from low to high in a highly customizable way. Nowhere near as fancy as the larger TaoTronics, but it's the only one on the list with two nozzles, so you can point one in one direction and the other in a completely different direction, increasing your ability to customize where the humidity goes (like towards two kids' beds in the same room!). Unlike the AnyPro, Pure, and Seneo, this humidifier uses a ceramic filter that helps clean bacteria and other impurities from the water. However, this means you'll need to clean and/or replace the filter with use. Like the others on this list, it automatically shuts off (and shows a red light) when the water level is low. It doesn't work as an essential oil diffuser, in case you're interested in that feature. Note that we tested this unit for 7 months and found that it got a bit louder with time, which was unfortunate. Other than that, this is a great, super quiet, and reliable humidifier that's easy to clean and fill. Just a few drawbacks, including the filter and a bit of noise developing over time. Interested? 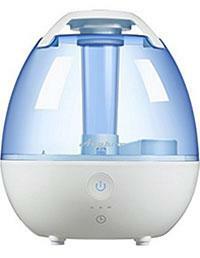 You can check out this TaoTronics Humidifier here. 7. 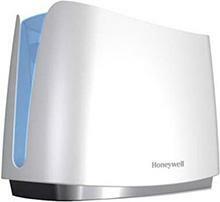 Honeywell Cool Mist Humidifier. About $50. This is a powerhouse humidifier that's been manufactured by Honeywell for several years. We were able to get our hands on one of these units and give it a thorough review last year, and we are happy to report that it is still running strong! 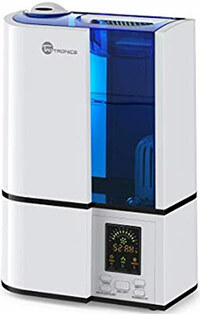 This humidifier has a 1-gallon (about 3.8 liters) water capacity, which keeps it running on high for about 9 hours (overnight), or up to about 24 hours on low. That's excellent for running all day to keep a room moist for naps and then bedtime. The operation was whisper quiet especially on the low setting, though there was a gurgling sound every once in a while, as the water moves down from the reservoir. We found the reservoir easy to refill, with a nice wide fill hole, and easy to clean as well. Honeywell markets this as "germ-free" by using ultraviolet light to kill a range of bacteria before it is misted into the room. 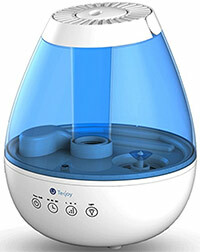 Unlike most other cool mist humidifiers, this unit does not use a nebulizer. Instead, it uses a moisture wicking filter and blows room air through it to release moisture into the room. It works very well, though we have to be honest that it's a pain to replace these filters every few months (and it gets pricey!). But that filter does do a nice job of trapping minerals in your water, rather than releasing them into your room and causing the white mist on your furniture; so, pros and cons. Another drawback is that the unit is short and wide, so it does take up a lot of space on the top of a dresser or table. Overall, you're getting an excellent, high capacity and reliable humidifier here. If you're willing to put in the work and cost to change the filter every few months, this will be an excellent option for you. And at only about $50-60, it's a great deal! 8. 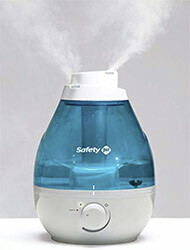 Safety 1st 360 Degree Cool Mist Ultrasonic Humidifier. About $30. Here's another good option made by a company with a strong reputation for making high quality baby products at a reasonable price. There are a few things that make this is a great option for your family. First, it is whisper quiet, and even after several weeks of testing it hasn't gotten any louder. When you're looking for a nursery humidifier, the sound level is really important and this makes a great quiet option. Second, it has an awesome dual-direction 360-degree nozzle, so you can orient the cool mist in two directions at the same time. This is super helpful when you're trying to evenly fill a room rather than point it in one direction (and end up with a moist carpet in the morning!). Third, it uses a 2.5 liter tank which is a pretty small size, lasting about 20 hours on a low setting. Speaking of adjustable settings, rather than using discrete low-medium-high settings, this humidifier uses a continuous knob that lets you dial in the perfect setting for your room size and duration of use. We put it on a medium setting and it lasted through the night (from 8pm to 7am) and had about an inch of water remaining in it. Like many of the other humidifiers on this list, it is ultrasonic and doesn't require a filter. It will auto shut-off when it runs out of water, and a light will turn on when you're running low on water. Not too bright to wake up a sleeping baby. So overall we really liked the features and functionality of this humidifier, and definitely suggest checking it out if you're looking for a relatively cheap nursery humidifier that will pack a pretty good punch. Downfalls? Well, relative to other options on this list, its construction isn't quite as high quality. Some of the parts, such as the screw-on fill cap, felt a little flimsy and brittle; some customers have complained on Amazon that it broke when trying to remove it. Never happened to us, but like with all humidifiers you need to be really careful about how much you tighten that fill cap - you want to hand-tighten it until it's barely snug. If you over-tighten it, the expansion of the plastic will make it a total bear to remove. So be careful with that. A second thing is that cleaning is pretty difficult because the fill cap is so small. You will only likely need to clean it about once a month, especially if you don't let water sit in it for several days. But when it is time for cleaning, it's not as easy as most of the other options. With those negatives being said, it's important to realize that this is a 2.5-liter humidifier that can be purchased for under about 30 bucks. And that's a sweet deal and makes it worthy of this spot on our annual list! We'll update after several months of use. 9. Ultrasonic Cool Mist Humidifier w/Diffuser. About $50-60. Like the Seneo option, this humidifier can disperse aromas and essential oils from a small tray located on the bottom of the unit. Add in some soothing lavender or chamomile essence and make your baby's room smell amazing! But it's not just that feature that makes this an excellent humidifier. This has a 2.8-liter (about .75 gallon) water tank, a huge range of speed adjustment, several night light color glow options (or you can turn it off), and it goes for about 8-9 hours according to our tests. We turned it on high speed at 8 pm, and it was empty by 5 am - maybe that's why our baby woke up so early! Unlike the above humidifiers, this one uses a stone filter that claims to get rid of water smells (like chlorine odor). We're not sure how well it works, especially over time, but it's a nice touch. Unfortunately, even with that filter you still need to clean the tank like any other humidifier. This is a very reliable unit and the company is very responsive to any issues. The only drawback for this humidifier is that we found it a bit louder than the Pure or TaoTronics. We didn't use any sophisticated sound meter or anything, but it just seemed to have a louder hum than the above options. 10. Vornadobaby Huey Evaporative Humidifier. About $100, and definitely one of the better humidifiers on the market for a few reasons. Though the tank is exceedingly small at about .25 gallons of water, it is super easy to refill and clean. It has a convenient little handle that you use to pull the tank out (about the size of a water bottle) and refill. Instead of having just low and high settings for fan speed, it also has humidity adjustment so you can set the desired humidity (we used 55%) and it will cycle on and off as needed. Or you can tell it to be on continuously. This humidifier uses a "wick" filter that you'll need to replace every few months, at the cost of about $7 each. Just like any other humidifier, you'll need to clean the tank frequently. Drawbacks? Well, the water tank is really small so you're not getting a ton of moisture into the air overnight. It's also not super quiet like the ultrasonic options on the list. In fact, it was the noisiest one we tested. During the fall and winter months, the cold strips the humidity from the air, and heating your house makes it even worse, especially if you have forced air heat blowing into your baby's room. All that dry air makes symptoms worse for your baby, and makes it take much longer to recover. The nighttime is when your baby's immune system will get a chance to fight viruses and clear up symptoms. This is the perfect time to fill up and turn on a powerful and safe humidifier to add some moisture back into the air, soothe dry throats and coughs, and help your baby fight viruses. So, what should you look for in a humidifier? Cool versus warm mist humidifiers for babies: Doctors recommend cool mist humidifiers. There are two types of humidifiers - cool and warm mist. Both add moisture to the air, but warm mist humidifiers are more dangerous. Both cool and warm mist humidifiers add moisture to the air, but they do so differently. Cool mist humidifiers force water to dissipate into your room without using heat. Warm mist will heat the water and then send it into the room in the form of steam. Though you might think that warm mist would be better because it will keep your baby warm and cozy at night, cool and warm mists are exactly as effective as each other for helping coughing and congestion (if you don't believe us, read about it at the Mayo Clinic). But warm mist humidifiers are dangerous for use in a baby's room: they can spill hot water, and burn your baby if they get too close to the steam. They are also more expensive than cool mist because they have the added heating element, and they are much noisier at night with the bubbling and hissing involved in heating the water. Noise levels vary across models. Some humidifiers run low-quality fans and fan motors that introduce a loud drone into your baby's room. The better-quality humidifiers use quieter fans, or even better, no fan at all and instead rely on ultrasonic humidification. Cool mist are also quieter than warm mist because there is no background bubbling and hissing noise from boiling the water inside the unit. The humidifiers we recommend above are some of the quietest we could find. Germs and bacteria cause problems. If your baby is sick, the last thing you want to do is pump more germs into their room. All humidifiers, even the ultrasonic ones, and both the warm and cool ones, can build up mold and bacteria in their tanks and other components. If you're considering using a humidifier in your baby's room you must be sure to clean it regularly (like every few days)! A solution of 90% water and 10% bleach is perfect, just make sure you rinse well after cleaning. Also be careful where you point the humidifier in your baby's nursery: try to avoid pointing it directly at your crib (see our reviews of baby cribs here) or glider (see our reviews of nursery gliders here), since that might cause dampness, mildew and mold to form on the furniture.